Your desk is probably like most office spaces, with warm and dry air, fluorescent light fixtures and subject to random drafts from the door, air conditioning or heating ducts. Add infrequent watering, weekends and vacations when no one is available to care for your plants and your desk becomes a desert wasteland. Of the more than 1,000 species of cacti, some grow in jungles but the majority grow in deserts. While most houseplants aren’t suited for an office desk, most cacti and succulents thrive in the adverse conditions of an office environment. The best cactus for an office is one that thrives with little water and plenty of light, and is small enough to fit on a desk. Cacti range in size from the giants of the Sonoran Desert (Carnegiea gigantea) to the Chihuahuan Desert’s Living Rock Cactus (Ariocarpus fissuratus), which only grows up to 6 inches (15 cm) tall and up to 8 inches (20 cm) in diameter. Other small cacti suited to office life include the Sea Urchin Cactus (Astrophytum asterias), only 2.4 inches (6 cm) tall and 6 inches (15 cm) wide, Bishop’s Cap (Astrophytum myriostigma), up to 40 inches (1 m) tall and up 8 inches (20 cm) wide and Mammillaria zeilmanniana, up to 5 inches (12.5 cm) tall and up to 3 inches (7.5 cm) wide. All of these cacti thrive outdoors in U.S. Department of Agriculture plant hardiness zones 9a through 11. While you may think of spiny, desert plants when you consider a cactus for your desk, there are several tropical cacti that thrive indoors. Rhipsalis species and the familiar Christmas Cactus (Schlumbergera bridgesii), Thanksgiving Cactus (Schlumbergera truncata) and Easter Cactus (Hatiora gaertneri) are all species of tropical cacti that thrive in USDA zones 10 through 11. These jungle cacti do much better in medium light and should only be placed in direct sunlight in the winter. Among the succulents often grown on office desks are Jade Plant (Crassula ovata), Dwarf Jade (Portulacaria afra) and Aloes, which thrive in USDA zones 9 through 11. Water the plant every two to three weeks, whenever the soil is dry, and give it plenty of light. 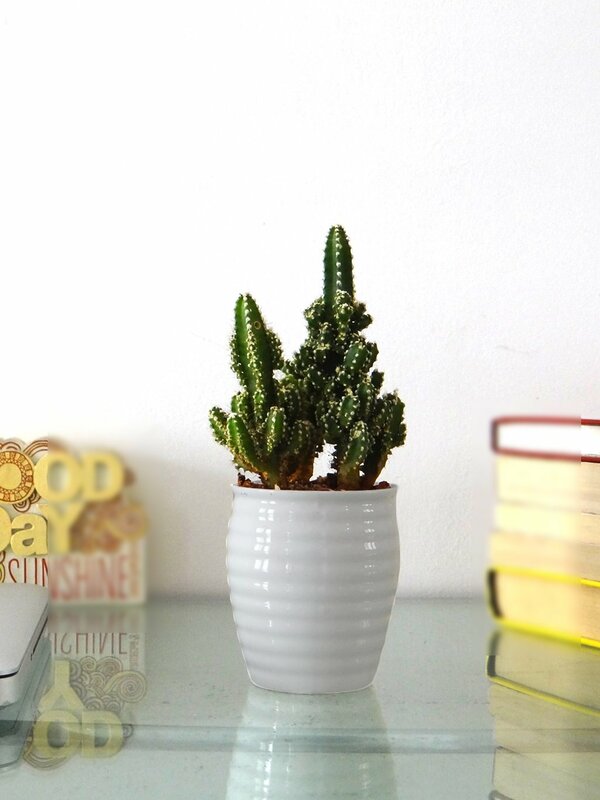 Cacti thrive in full sun, simply add a lamp with a fluorescent bulb to your desk. A lamp timer ensures that your cactus or succulen receives the additional light even when the office is closed. The most difficult part of growing a cactus or succulent on your desk is convincing your coworkers that they don’t need to water your plant for you when you’re on vacation. The most common death cause for cacti and succulents is overwatering.